I remember cooking for my friends many many years ago, and pushing my epicurean prowess then to make delicious dishes worthy of sharing – Foie Gras Stuffed Schiaffoni; Roasted Goose with Chestnuts, Prunes, and Armagnac; Valrhona Chocolate Mousse with Orange Cakelets. I was a culinary student then, and I remain so today, always learning. Something about diving in with all fours into new adventures, experimenting, and aiming for that “oooh” factor is infinitely gratifying. Don’t get me wrong, I still do love that homemade simple fish stick, or fresh pesto pasta night, or any other simple five ingredient comfort food after a long hard work day. For me, cooking something complicated that you’ve never cooked before is plain simple fun. It’s not pretentious to aim for new heights with highbrow cooking, especially when the finished plate resembles a painting hanging at the MOMA. I’ve been endeavoring to sharpen those plating skills to heighten the visual as well as the aromatic flavors. However this dish was all about the sauce. Although unseemly lurking on the outer edges, the nutty and earthy flavors of the caramelized onions come flying through even with the smallest of bites. 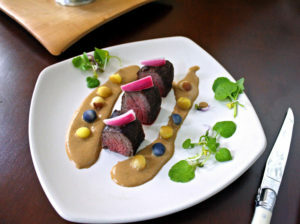 Using a melon baller on heirloom potatoes kept the petite presentation proportionate, while still injecting a hint of tradition for essentially steak and potatoes, and the pickled red onion added a little zing. To my friends who I have not cooked for in a while, this one will definitely be a do over. Season beef on both sides with salt and pepper. Place beef with rosemary sprigs on each side into vacuum pouch and seal. Sous vide for 2 hours. Remove steak from sealed bag, discarding rosemary, and let rest. In a skillet over medium heat, warm oil. Add onions and cover. Cook for 1 hour, stirring occasionally. Increase heat to medium-high, add butter. Once butter is melted, add sherry and cook for additional 1 minute, and add stock and simmer for 2 minutes. Remove from heat and season with salt and pepper. Transfer to bowl of food processed, and puree until smooth. Pass through a fine mesh sieve into bowl, discarding solids, then whisk in crème fraiche. Mix all ingredients and pour into a small mason jar. Then add onion wedges. Refrigerate for at least two hours, or overnight. In a skillet over high heat, melt the butter. Add steak and sear on both sides until just crisp, about 2 minutes per side. Remove from heat and let rest before slicing. Note: Use a 10-15 millimeter melon baller to make potato pears. Boil in salted water for 3 minutes, then drain. This entry was posted in Cooking, Fall, Main Dishes, Summer and tagged Beef by cfaust. Bookmark the permalink.